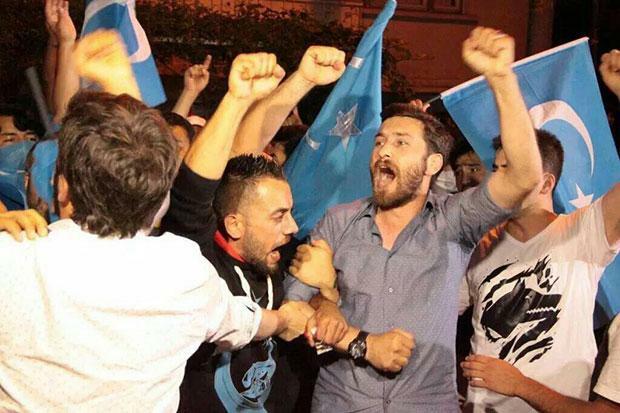 July 9, 2015 (Tony Cartalucci - ATN) - Mobs brandishing the blue and white flag of the fictional state of "East Turkistan" located in present-day Xinjiang, China, attacked and destroyed the Thai honorary consulate-general in Turkey's capital of Istanbul. The attack came after Thailand's decision to deport Chinese Uighurs being trafficked through Thailand back to Turkey or China depending on their citizenship. Images; Allegedly "Turkish people" stormed Thailand's consulate in Istanbul, Turkey, yet the mob was clearly carrying the blue and white flag of the non-existent state of "East Turkistan" - a region the US hopes to carve out of what is currently China's Xinjiang region. It was reported the group gathered in front of the consulate to make a press statement around 11pm local time (about 3am Thai time). Then the protest turned violent and the crowd broke into the consulate building, smashed the windows and lowered the Thai flag. Security authorities later dispersed the group, it reported. There were no injuries reported. Security forces apparently held off until after the attack was carried out to disperse the well-prepared mobs. To understand why Turkish security forces would allow an attack to be carried out on Thailand's consulate requires a deeper understanding of the role Uighurs, Turkey, and the US State Department itself has played in undermining peace and stability in China and the changing dynamics Thailand's new government has introduced into the game. Geopolitical analyst Eric Draitser in his article, "Turkey, Terrorism, and the Global Proxy War," lays out in detail the role of Turkey in what is a larger global network of state-sponsored terrorism used by the United States to project power across the globe. Uighurs in particular are linked to Turkish-run networks stretching from China, throughout Southeast Asia, and all the way to the Middle East, moving Uighur fighters to and from various theaters of operation, including into Syria where Uighurs are literally fighting alongside "Islamic State" terrorists. Images: (Top) A screenshot from NED's website refers to the non-existent state of "East Turkistan" in what is an overt sign of support for violent separatists attempting to carve off Chinese territory in a campaign of bloody terrorism. (Bottom-left) The flag for the fictional state of "East Turkistan" is blue with a white crescent moon and star often carried by (bottom-right) mobs organized around the world by NED-funded organizations to support terrorism in China's Xinjiang region. He also points out the immense US funding and political backing provided to separatists in China's Xinjiang region via the National Endowment for Democracy (NED) who uses the term "East Turkistan" - the fictional state separatists refer to China's Xinjiang region as. The flag for the non-existent nation of "East Turkistan" includes a blue background with a white star and crescent moon, such as was carried by the mobs attacking the Thai consulate. International Uyghur Human Rights and Democracy Foundation $187,918 To advance the human rights of ethnic Uyghur women and children. The Foundation will maintain an English- and Uyghur-language website and advocate on the human rights situation of Uyghur women and children. International Uyghur PEN Club $45,000 To promote freedom of expression for Uyghurs. The International Uyghur PEN Club will maintain a website providing information about banned writings and the work and status of persecuted poets, historians, journalists, and others. Uyghur PEN will also conduct international advocacy campaigns on behalf of imprisoned writers. 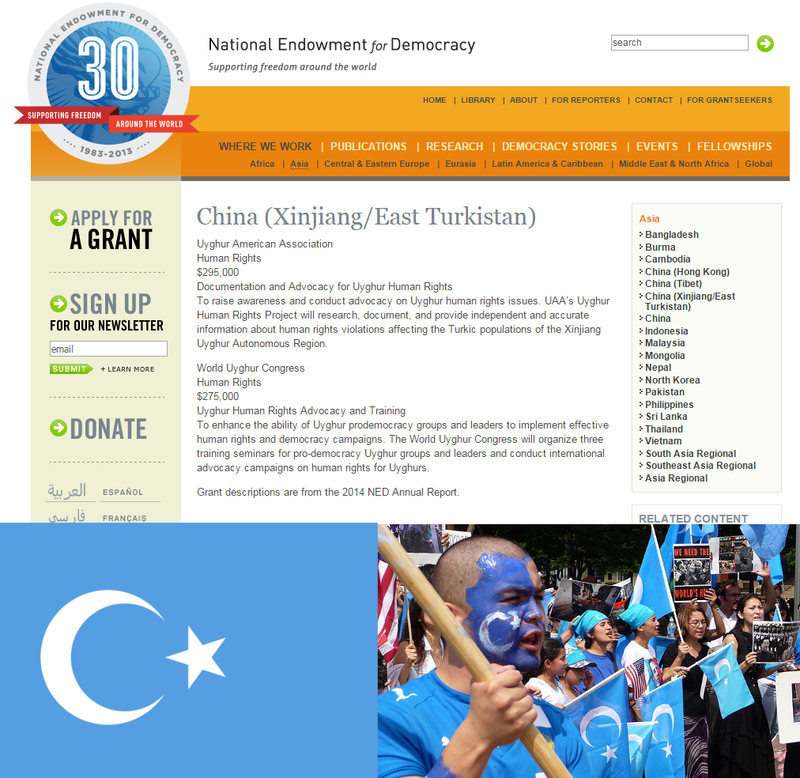 Uyghur American Association $280,000 To raise awareness of Uyghur human rights issues. UAA’s Uyghur Human Rights Project will research, document, and bring to international attention, independent and accurate information about human rights violations affecting the Turkic populations of the Xinjiang Uyghur Autonomous Region. World Uyghur Congress $185,000 To enhance the ability of Uyghur prodemocracy groups and leaders to implement effective human rights and democracy campaigns. The World Uyghur Congress will organize a conference for pro-democracy Uyghur groups and leaders on interethnic issues and conduct advocacy work on Uyghur human rights. All of the above listed organizations serve as political fronts of the armed terrorist organizations carrying out deadly attacks in China and beyond, targeting police and civilians alike - including the horrific knife attack at China's Kunming rail station in 2014. Many of the above-listed organizations have even provided rhetorical defenses for such attacks. Like the US NED has done in Thailand itself, it hides behind the pretenses of "human rights" and "democracy" to prop up what is essentially armed terrorism aimed not at advancing the interests of local people, but to advance Western agendas centered on weakening national sovereignty and forcing geopolitical and economic concessions to the benefit of Wall Street, London, and Brussels. It is no surprise then, that these same US-backed interests in Thailand have spoken up specifically about the Uighur issue, siding with US rhetoric. Rights groups have expressed concern over Thailand’s decision to send the Uighurs back to China fearing they could face ill-treatment and even torture. "It is very shocking and disturbing that Thailand caved into pressure from Beijing," Sunai Phasuk, Thailand researcher at Human Rights Watch, told Reuters. Sunai Phasuk, of course, is one of several "rights advocates" supporting NED-funded sedition inside of Thailand itself, including the most recent manufactured incident involving the jailing of 14 "students" protesting the current government. Joining Sunai Phasuk in support of the political charade would be NED-funded Prachatai as well as "Scholars at Risk," a US-based NGO also funded by NED. 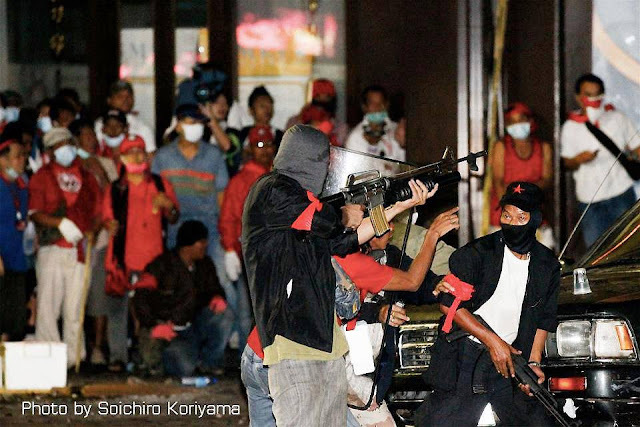 Image: Thailand has gotten its own taste of US-backed terrorism when in 2010 US-proxy Thaksin Shinawatra fielded an army of some 300 terrorists who engaged in gun battles over the course of weeks, killing nearly 100 and ending in a campaign of city-wide arson. For Thais, it is essential that they understand that US meddling in Thailand's internal affairs goes far beyond the traitors and sedition fueled by torrents of political, financial, and even operational support from overseas within their borders. It also includes the role the US attempts to use Thailand in to facilitate its agenda abroad - most importantly in destabilizing China, but also as far as supporting US-backed terrorism in the Middle East. Thailand's decision to no longer allow Thai territory to be used in trafficking Uighur agitators, terrorists, and political provocateurs has resulted in the immediate attack on their consulate in Turkey, and likely to further covert destabilization within Thailand itself. Recent ties between China and Thailand have been growing stronger, manifesting themselves in a variety of immense, joint infrastructure projects as well as a potential, lucrative submarine purchase by Thailand's Royal Navy. The US has been increasingly open about the need to disrupt these growing relations, and amid its attempts to foster conflict in the South China Sea, it is increasing attempts to destabilize Thailand and disrupt its political and economic interests at home and abroad as well. The attack on Thailand's consulate in Turkey by mobs brandishing yet another flag of US-meddling, is as good as an attack by the US itself. America's Turkish allies intentionally allowing the well-organized attack to be carried out before dispersing the mobs reflects the very intentional message Washington is sending to Bangkok - obstructing Western hegemony may be hazardous to one's health. Yet, as history has proven, capitulation to Western hegemony is also hazardous, perhaps more so. Thailand's growing ties with China are born out of a mutual understanding that neither will survive by attempting to accommodate the West who is so clearly bent on dominating the East, and whose idea of "accommodation" requires the East's complete surrendering of any semblance of sovereignty.